Do You Have What it Takes to be a Front-End Developer? Looking through job postings for a front-end developer can be overwhelming. Since no two front-end developer job descriptions are alike, it can make you wonder: what are the essential skills I actually need to become a front-end web developer? How do I decide what kind of front-end developer I want to be? That's exactly what I want to answer in this post. I'll cut through those conflicting job listings to identify the key front-end developer skills you should focus on based on your personal goals. Plus, you’ll find out how to actually learn those skills and take big steps towards becoming a front-end developer. Download a free checklist that will walk you through all the skills you need to become a front-end developer. First of all, what does it actually take to become a front-end developer? This way, you'll get a sense of what front-end developer requirements are in the real world—instead of a context-less front-end developer skills list that may not be based on the real tech industry! Let's take a look at what companies are searching for when hiring a front-end developer. As mentioned in the beginning, every front-end job description is different and lists a ton of skills, and you'll see this first-hand here! However, don't worry: you don’t necessarily need to have ALL of these skills. Here’s a look at just how different job listings for front-end devs can be. This front-end engineer listing asks for some back-end skills as well (Python and Django). You'll also notice a few key soft skills highlighted. Notably, you should work well with a team and be a good communicator. These days, development can be a fairly social role; no more solitary cubicles! In this junior front-end developer listing, you'll notice that it requires design and UI/UX skills with knowledge of Photoshop and Sketch. This demonstrates that some front-end developer jobs focus more on the coding, others focus on the visual design, and many will combine them to one degree or another. This front-end software engineer job posting, requires knowledge of ES6, d3, webGL—still more different languages than the ones above! Another difference in this listing is that it mentions having a relevant BA/BS degree, whereas the previous two mentioned experience only. This last job requires front-end developer skills including SASS and MVC frameworks, knowledge of Git version control and branches, and front-end build tools like NPM, Webpack, and Grunt. As soft skills go, you'll notice that communication makes another appearance here! Since front-end developer job listings can vary so widely, it's useful to narrow your focus more. It may be a good idea to check your dream company’s tech stack to inform what you should learn. Ask yourself: if you could work anywhere, what companies would you pick? Then search job postings to see what front-end developer skills they usually ask for, and learn those to reverse-engineer your dream job. Let's turn to the increasingly popular developer bootcamps and see what they are instructing. My reasoning behind looking at coding bootcamps is this: if a person is dishing out a few thousand dollars to learn front-end skills, the course had better teach industry standards. I'm going to use General Assembly (GA) as the primary example, because they have learning centers across the US and even in cities internationally. This doesn't mean these skills aren't important, but it does mean that they're not “core” front-end developer skills. Basically, they're not the first skills you should learn to become a front-end developer: they're extras that can come after the essentials. Using Course Report to sift through other front-end bootcamps/courses quickly, I found that while they do have variations in what they teach, there are also front-end languages in common. We've looked at job descriptions, what companies are using, and what bootcamps are teaching. Now, it's time to hear the perspective of an expert! 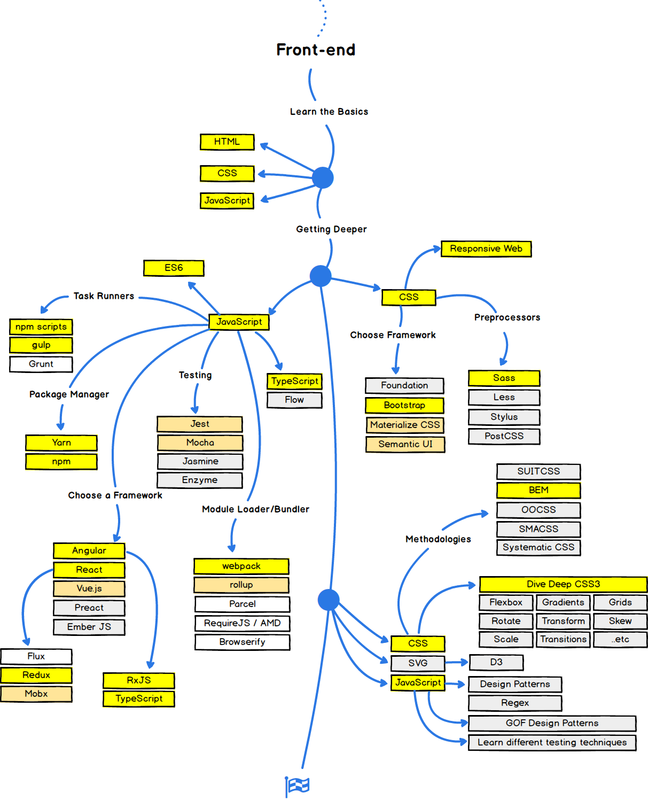 Brandon Morelli, creator of @codeburstio, has an awesome mind map that shows important web development languages, frameworks, and tools to learn. As you can see, he mentions a bunch of front-end technologies (some of which do not appear in the job listings or coding courses above). Here's a look at what Brandon recommends learning to become a front-end developer. As far JS framework options go, there are tons out there, but three of the most popular are Angular, React, and Vue.js. Brandon recommends learning Angular or React. But be prepared: learning a JS framework is the toughest part of becoming a true front-end developer! Preprocessors: Using a preprocessor (or precompiler ) has a lot of advantages, like making code cleaner, maintaining organization, and better following DRY principles. Popular CSS precompilers are as Sass, Less, and Stylus. You only need to learn one; Brandon suggests Sass. CSS Frameworks: These help optimize your workflow with built-in grids and other CSS components. Two popular examples are Bootstrap and Foundation. Brandon personally recommends Bootstrap. Responsive web design means being able to build sites that work on all screen sizes—desktop, tablet, and mobile. Responsive design is intrinsic to frameworks like Bootstrap and Foundation, so if you learn one of those frameworks, you're good to go. Package Management: This includes tools such as Yarn or NPM. When projects get large, it can be tough organizing all the libraries, assets, and so forth. Package managers helps with managing all the parts. Task Runners: Good examples are Grunt, Gulp, or NPM scripts. They run on the command line, compress files, and also act as a compiler for Sass or Less. They also have a wide range of plugins boasting other features. Jest, Mocha, Jasmine and Enzyme are tools that help developers write tests for applications. Out of everything on this list, learning how to test your applications comes last. It's a nice addition to your resume, but you can definitely get a front-end dev job without it. This may seem like a long list of front-end developer skills to learn, but Brandon himself emphasizes that you do not need to learn every single thing. Depending on the company and role, you can get a job as a front-end developer with a few well-chosen web development skills. So, what skills should you actually start learning, and how can you become a front-end developer? These skills appear everywhere. You need a strong grasp of each just to have your foot in the door. As noted in the jobs listings sections above, soft skills are often just as important as your hard skills. Aside from being a good communicator and team player, there are a few more things you can focus on. Be humble enough to learn from your mistakes (everyone makes them!). Lastly, from the application process to each day at the job, do your best to show that you’re passionate and motivated about what you do. Starting with the basics is fine, but to give yourself the best leg up during job-seeking, pick up a few skills that go beyond them. So, to stand out, add a few of these to your repertoire! Says this commenter, “Frameworks such as Angular and Backbone are optional to learn, but nice to have.” The same goes for other JS frameworks–the more you know, the more job options will become available to you! Since front-end devs are working on what is visible to customers and users, it's valuable to understand what matters to them. What elements work best visually together? How can you provide a smooth navigational experience? What kind of flow is intuitive for the kinds of users you're targeting? Sure—you're looking for how to become a front-end web developer. Even so, there are a few languages on the back end that you're most likely to run into as a front-end dev. To build a working product, you will most likely need to integrate front-end code with server-side technology at some point, or at least collaborate with back-end or full-stack developers. However, while it’s good to have an understanding of these languages, you don’t necessarily need to know them thoroughly to be a great front-end developer. These are the skills that will help you stand out so you can get that front-end development job! Here’s a list of online resources to help jumpstart your career in front-end development—going from complete beginner up through more advanced topics. If you're new to tech, you should start by understanding CS fundamentals before even looking at more complex code. Remember that you don't have to meet every requirement when applying for a position. The good thing about becoming a front-end dev is that you’ll learn new languages and frameworks on the job and as you build your own side projects. Few people start their careers as an expert, after all! Moreover, keep in mind that job descriptions are like a hiring manager’s wish list. If you master every skill and meet every requirement, you're probably overqualified. Nevertheless, here's my advice: Any computer/technology/design know-how that you have, bring it to the table. You never know what an employer might be looking for. And you just may be perfect, even if (or because) you have an unconventional background! To find front-end developer jobs, start by checking out Stack Overflow, which specifically features jobs for developers! The answer to the question “do you have what it takes to be a front-end developer?” is an enthusiastic yes! As long as you’re willing to put in the work to learn the in-demand front-end developer skills required, and honing your soft skills like flexibility, willingness to learn new skills, and passion, you'll be an amazing front-end dev.